"Greensboro , N.C. – The End of Summer Music Fest 2nd Annual Fundraiser will be held Saturday, Aug. 28, 2016 in Aggie Park from 3-8pm. This community event shines light on talented artist, small businesses, deserving college students and community leaders who are making a difference in to Triad. Each year a charity is chosen to receive a portion of the proceeds. This year, we are proud to announce “I Rock My Curves The Best” nonprofit as our charity of the year. In addition, three $500 college scholarships will be awarded to deserving students. Event is open to the public. Purchased tickets the day of at Aggie Park located on the corner of Gate City Blvd and Florida St.. 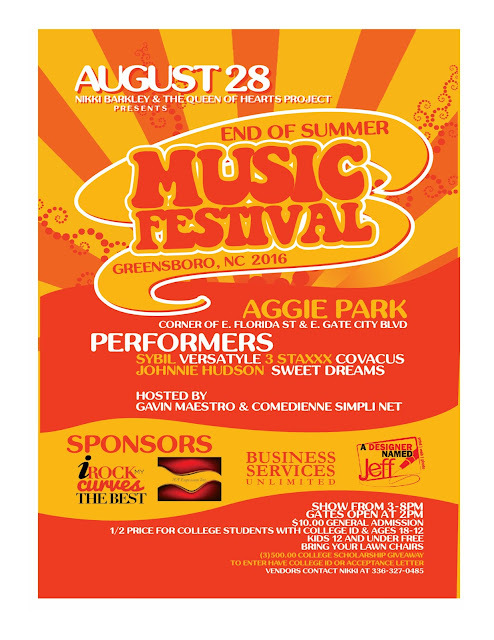 Featured Artist: Sybil, Versatyle, 3 Staxxx, Covacus, Johnny Hudson, Sweet Dreams, and Comedienne Simply Net. For more information to do a live airing, to donate, become a sponsor or volunteer contact Ms. Barkley at Msnbarkley@yahoo.com or 336-327-0485."